SumTotal Systems, a Skillsoft company, delivers the SumTotal Work suite of solutions that provides time and attendance, scheduling, absence and leave management, and payroll data processing. Through a virtual data record, it unifies these areas of workforce management (WFM) and core HR with key elements of the rest of human capital management (HCM), providing far improved visibility into people-related data organization-wide. 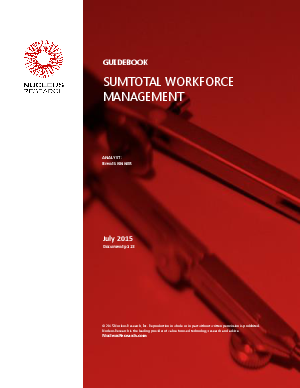 Notably, SumTotal’s solutions can combine WFM data with learning management data, including access to Skillsoft’s extensive library of content, pushing information that is immediately usable and pertinent to the user – whether that be support staff, line managers, or executive leaders. With these improvements in data visibility across these areas, users are given an opportunity to make better-informed decisions about their work and about the workforce – to comply with employment law, for instance. Additionally, the solution improves customers’ ability to track employees’ time, with fewer errors in scheduling. For planning and strategic decision making, SumTotal’s solutions reduce errors, too, in transactions and reporting. Customers using the applications benefit from robust extensibility – without having to resort to costly customization.